Baby Pibu has gift sets for every baby and every budget. Our Newborn Essentials Skincare Kit is a luxurious set that provides everything new parents need to stock their nursery, complete with doctor’s instructions on each product’s use. The set comes in a beautifully designed keepsake box, perfect for every nursery. Our Luxury Basics set contains full-sized items that new parents need to care for their baby each and every day. Our Baby Butter and Pibu’s Bathtime Wash are paired with a soft bristle brush, complete with instructions on how to care for your baby during bath time. The Blissful Bottom gift set has everything parents need to care for baby bottoms. Full-sized Bottom Balm and Intensive Bottom Relief, complete with doctor’s instructions on care, will help parents prevent and treat bouts of diaper rash. The Soothing Eczema Kit is just what the Dr. Mom ordered to prevent and treat dry, sensitive skin or eczema. The set comes with full-sized bottles of Hydrating Ointment and Rash Relief, and doctor’s instructions on how to care for sore skin. 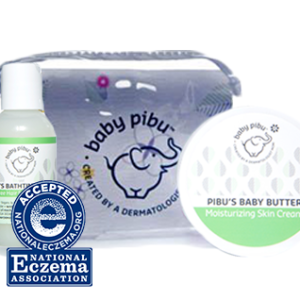 Lastly, our travel-sized gift set, the Daily Care Travel Gift Set, contains small, TSA-approved sizes of your favorite Baby Pibu products. All products come in a handy zippered bag. Perfect for diaper bags too!